On Friday, June 25, the Walt Disney Company held a special celebration for the 40th anniversary of the Walt Disney Archives and for Dave Smith, the founder and chief archivist of the Walt Disney Archives. The occasion also marks Smith's fortieth year at Disney. Back in the late 1960s and early 1970s when other studios were selling off their historical assets, then Disney CEO, Roy O. Disney, wanted to do something to preserve the history of the Disney company and his brother Walt's legacy. Roy's solution was to hire Smith, then a librarian at UCLA. In 1970, Dave was added to the Disney payroll and went to work on creating a company archives. Now, forty years later Dave is still preserving the Disney legacy. In the beginning, Smith was a one man team with not much to work with - not even a real job description. Smith was to make up the rules as he went along. To get started, Smith knew he needed to first build up a collection for the archives and then later he could sort through what items may be useful for the purposes of an archives. Smith got to search through Walt Disney's office, closets and attics, and any other space on the Disney lot where treasures may have been packed away. Some of the items Smith collected were old letters, early Disney toys, photographs, posters, music cue sheets, and animation drawings to name a few. Today, Smith and his archives staff which now numbers twelve, continue to build up their collection. Exciting props and costumes from Disney productions or from the Disney theme parks are constantly making their way to the archives, as well as less exciting items, like press releases or annual reports. All in all, the Walt Disney Archives is an amazing achievement and a great resource for not only the Disney company, but the greater Disney community. I'm glad I got to be at the Disney Studio on Friday to see my friend Dave honored for his incredible accomplishment. The celebration was an entertaining and informative event. As you can imagine, Dave has many great stories to share. Below are some photos that my wife and I took at the Walt Disney Archives 40th Anniversary Celebration. Bob Iger presents Dave Smith with an award for his forty years of service with the Walt Disney Company. Leonard Maltin, the film critic, historian and Disney fan, hosted a conversation with Smith. He started way at the beginning, asking Smith where he grew up (Pasadena), what he did before Disney, how Roy Disney came to hiring Smith, and then his experiences over the next 40 years building the archives. It was a great discussion filled with many fascinating stories. Above is a slide that was shown of Smith with some of the early Disney toys he collected for the archives. Smith mentioned sometimes Disney's consumer products division will want to see items the company has licensed throughout the years. Above, Smith discussed meeting Disney's "Nine Old Men," Walt's label for a group of his highest regarded animators. When Smith started at Disney, some of the Nine Old Men had already left the company or were on their way out for retirement, but he did get the opportunity to hear stories from the different artists. Smith wanted to acquire their knowledge of the Disney company's past to help develop the Archives. Smith mentioned that some of the artists were more quiet and told the same stories over and over again. Other artists he said had many great stories and loved sharing what they new with Smith. One example was animator, Ward Kimball, who drew for Smith the layout of the earlier Disney studio properties, showing what was located where. Below is a slide of one of the drawings that Kimball made for Smith. After Maltin's conversation with Smith, Walt Disney Archives manager, Becky Cline, introduced a few special guests who were contributing some new items to the Archives. Above, writer Carlton Cuse, offers John Locke's knife and a ticket for Oceanic Flight 815, props that were used on the hit show LOST. Disney Studio Exec presents the $9,000 scepter used by the Queen of Hearts in Tim Burton's Alice in Wonderland. Karen Dotrice, who played Jane Banks in Mary Poppins, was on hand to contribute the jacket she wore during the laughing scene in the film. Onstage with Dotrice was her daughter who looks just like she did when she was younger. Somebody correct me if I'm wrong, but above I believe is Roy P. Disney, the grandson of Roy O. Disney and Walt's grandnephew, who was at the anniversary celebration to present a very special letter to the Archives. The letter Disney was contributing was written from Walt to his brother Roy. It was a letter to reconcile a three year feud the two had. The letter was typed by Walt personally and has been held in the Disney family's possession until this time. There were other presenters and many other great items donated to the Archives, but there are just too many to post. To learn more about Dave and the Walt Disney Archives visit the D23 website, the official community for Disney fans. Congratulations Dave! Oklahoma! (1955) was the first film photographed in Todd-AO 70mm widescreen. This movie was meant to be seen on the big screen - not your little TV or even kind of big flatscreen. Here is your chance to see this classic the way the filmmakers intended. 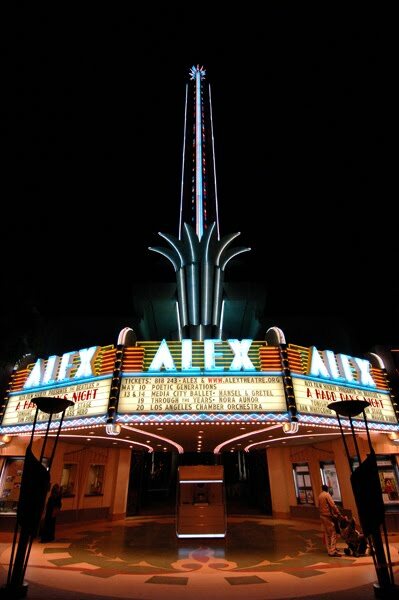 The film is being shown at the historic Alex Theatre in Glendale, California. The Alex, originally called the "Alexander" theater when it opened in 1925, was a venue for both vaudeville and movies. It also hosted many Hollywood previews and on occasion one would see various stars or other film folks around waiting to hear an audience's reaction to their work. Walt Disney previewed many of his cartoon shorts at the Alex during the 1930s. What's better than seeing a classic movie than seeing it in a classic venue? Third, the Alex Film Society, who is putting on this event often has special displays and guests. Not sure what they may have lined up this time, but below are a couple photos from what they had at their last event for a screening of the Marx Brothers film, A Day at the Races. When the Alex Film Society presented the Marx Bros. film, A Day at the Races, they brought in a few special guests. I didn't catch all of their names, but those I did were Gregg Marx (Gummo's grandson), Jade Marx-Berti (Groucho's grandaughter), and Lennie Bluett (one of the dancers from the film). How Much? $13.50 adults, $9.50 seniors, and $8 for students. 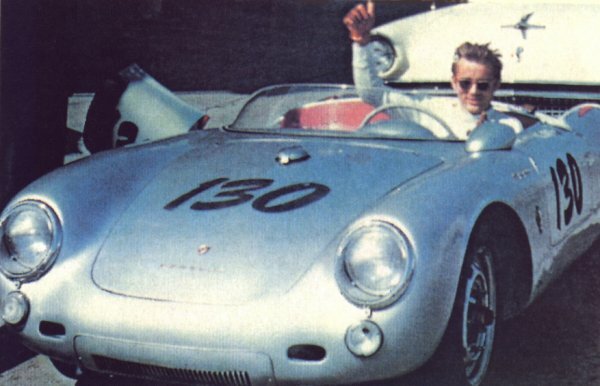 On September 30, 1955 James Dean would take his final ride. After completing filming on his last film Giant, Dean was preparing to leave Hollywood for Salinas, California to enter a racing competition. Of course, he never made it to the races. Dean died in a major car crash on his way there. Here are some of the places Dean was on that final day. 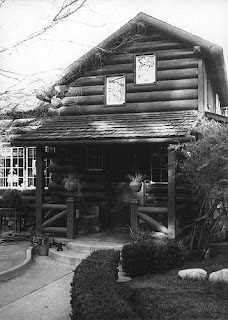 Prior to his death, James Dean was living in a log cabin house at 14611 Sutton Street, in Sherman Oaks, California. He rented the home from Nicco Romanos, the maitre d' at the Villa Capri, Dean's favorite restaurant, for $250 a/month plus utilities. The house had no bedroom, only a second floor loft. Guns belonging to Romanos decorated the place, along with Dean's bongos and bull fighting paraphernalia. Dean had a fascination with matadors, collecting bull horns and posters of bull fighters. 14611 Sutton Street, Sherman Oaks as it appears today. Dean's log cabin home has been replaced by this house. Dean drove his Ford station wagon which towed his Porsche Spyder race car, over to Bill's home. 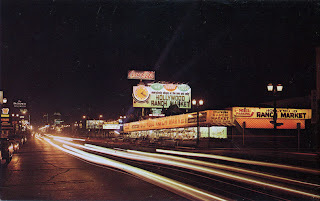 After picking up Bill, the two drove down Sunset Boulevard and turned onto Vine Street, arriving at Competition Motors. The Spyder needed some final adjustments in order to be race-ready, so Dean left the car with the German mechanic Rolf Weutherich. By 9:45a.m. Sanford Roth, a photographer, arrived at Competition. Roth had been following Dean for several days as part of a photo essay he was doing for Collier's magazine. Roth was to continue his essay by taking photos of Dean up at the races. Shortly after Roth arrived at Competition Motors, Dean's father and uncle came to visit. 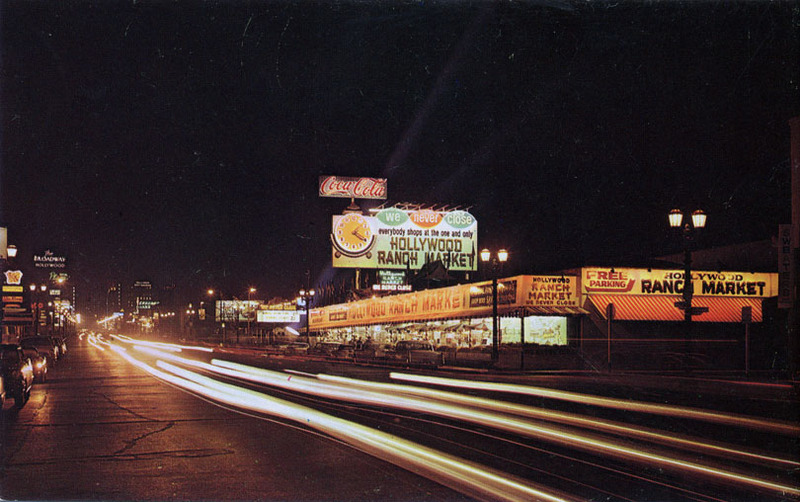 While Dean, his friends and family waited for the race car to be finished, the group walked a couple blocks down the street to the Hollywood Ranch Market where they had doughnuts and coffee. This market no longer exists and is not to be confused with the Fairfax Farmer's Market which still exists over on Fairfax and 3rd Streets. 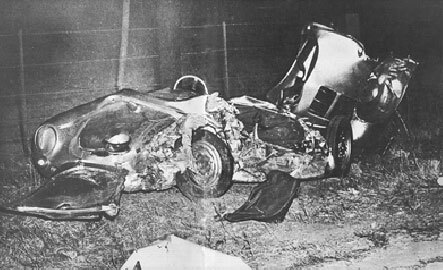 Dean's Porsche Spyder after the crash. By around 1:30p.m. Dean and his entourage were headed for Salinas. Dean drove his Porsche Spyder, with his mechanic, Weutherich, as his passenger. Hickman and Sanford followed in the station wagon. Of course, Dean never made it to the races. Dean had a major collision with a 1954 Ford Tudor which hit head on. The accident was at the intersection of Highways 46 and 41, not too far from Paso Robles, in Cholame, California. Bogie and Bacall - The two actors seemed like the perfect couple and I'm sure they really did love each other, but, did anyone really think that Humphrey Bogart could be totally faithful to Lauren Bacall, who was wife number four? In Bogart's case, it appears that the saying, "once a dog, always a dog" rings true. Verita Thompson, in her book, "Bogie and Me: The Love Story of Humphrey Bogart and Verita Thompson," details the long running affair the two had during the 1940s and 1950s. 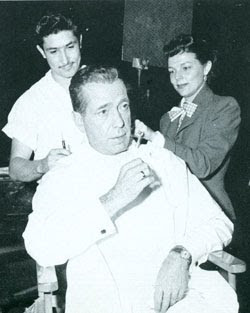 Thompson, a wig maker to the stars, first met Bogart in 1942 at a wrap party for Casablanca. At the party Bogart and Thompson danced and drank the night away. It was the "beginning of a beautiful friendship" - or maybe "beautiful" isn't the appropriate word. Bogart would continue to see Thompson after that night. When Thompon's husband at the time, Robert Peterson, was away on military service, Bogart would stop by Thompson's home in Burbank. The home was conveniently located near the Warner Bros. studio where Bogart worked, so afterwards, Bogie could visit Thompson without his then third wife, Mayo Methot, ever knowing. What is surprising is that, after Thompson divorced her husband and Bogart divorced Methot, he would go on to marry Lauren Bacall just 12 days later. Though this didn't stop Bogart from seeing Thompson. In 1949, when Bogart left Warner Bros. to form his own production company, he hired Thompson. Thompson was a wig maker and Bogart wore a toupee. It made perfect sense for Thompson to be working for Bogart. The affair continued until 1955, when Thompson, married the producer Walter Thompson. Verita Thompson remained friends with Humphrey Bogart until his death. 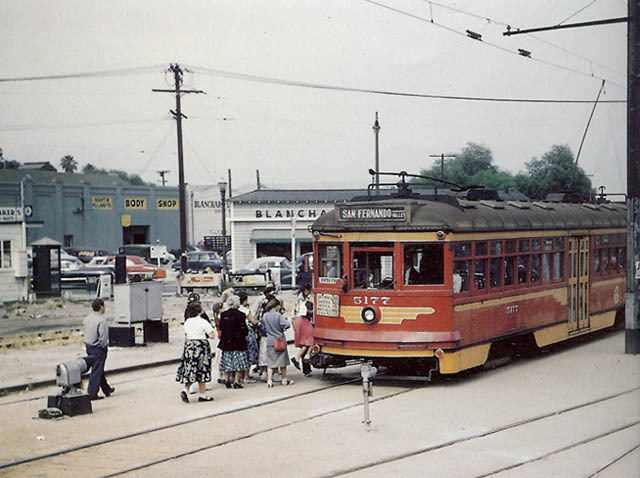 On Saturday, June 19, The Burbank Historical Society will be doing a special video presentation on the historic streetcars that served the Los Angeles area during the 20s, 30s and 40s. 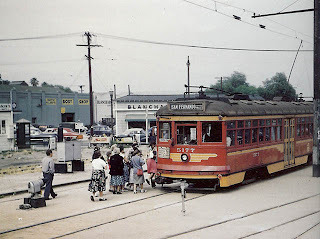 At one point Los Angeles had one of the most extensive rail systems in the country. I know - hard to believe, but that would come to an end during the 1950s. The film Who Framed Roger Rabbit even confronts this topic in a humorous way.